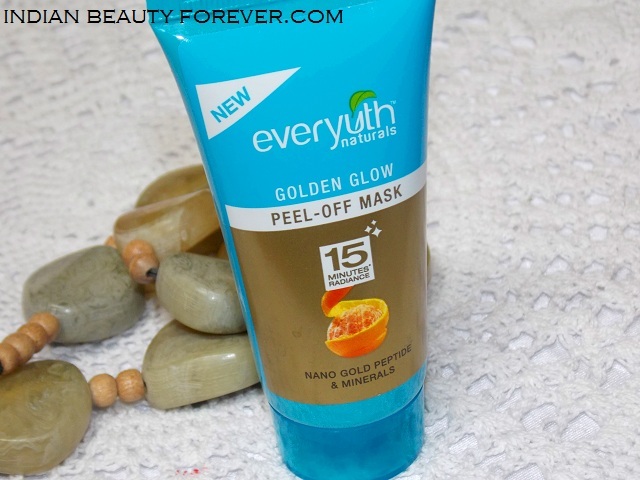 I will review Everyuth Naturals Golden Glow Peel off Mask which is once such product which if I am not wrong has been here since ages. 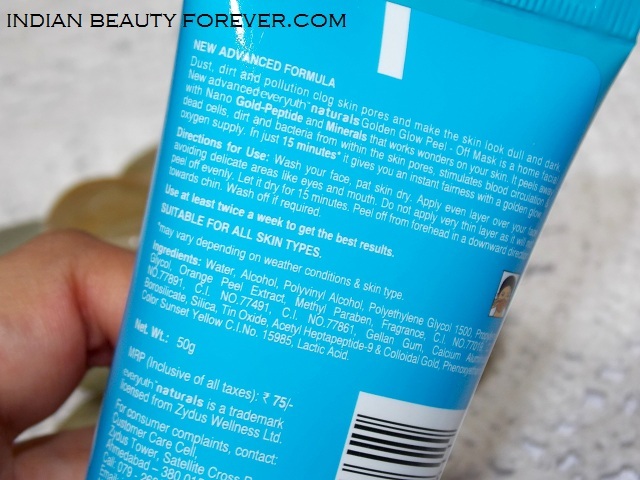 I have already reviewed Everyuth natural fairness peel off mask here. My first ever peel off mask that I had used was their orange peel off mask was. I still love that process off peeling the dried peel off mask off my face. 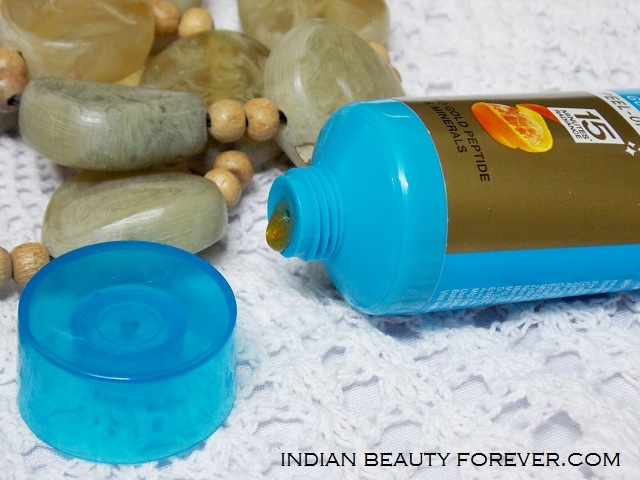 At times to get that quick refreshed face, home facial peel off masks or face packs can be really handy! 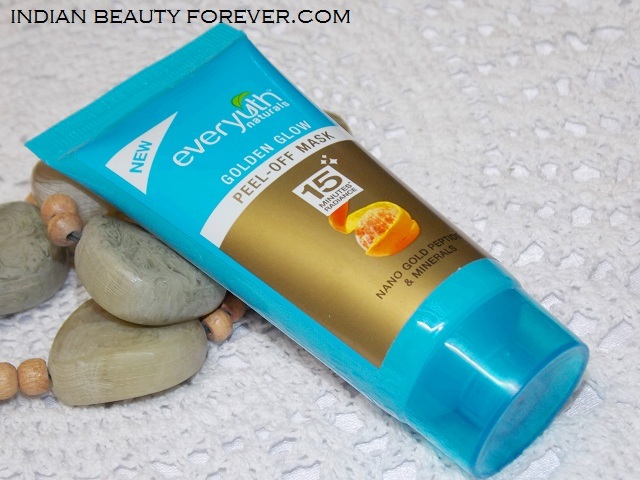 Everyuth Golden Glow Peel off Mask comes in a regular tube packaging which is priced at just 75 bucks and contains 50 g of the product. As the name goes, Golden Glow Peel off mask has these tiny gold particles, I mean they are golden in color but they are actual gold particles. This product has colloidal gold which means that the micro gold particles suspended in water. Colloidal Gold is known to rejuvenate the skin. 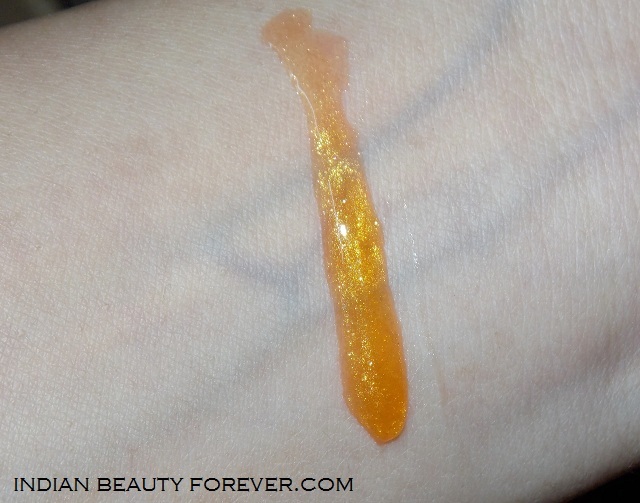 It smells like the orange peel off mask only as it has orange peel extract as one of its ingredients. When it comes to consistency such masks have medium consistency, which makes this peel off masks to get spread on the face properly. To skin stretching or dripping drops. It is said that these peel off masks should be applied in a slightly thick layer even if it feels that it has covered the entire face the thickness should be decent as once it gets dry, thicker peels are easy to get rid of. Moreover, once it dries, you need to start peeling it from the forehead downwards towards to the chin. Reason being, if you will try to do it in reverse, it will cause pain as the facial hairs will be pulled, hence it’s better to start peel off from the forehead. I have used this product a lot times like 2 years ago and may be 6-7 years ago as well so, it was not my first brush up with this golden glow peel off mask though as of now, I have used this tube twice. I feel that this golden glow peel off mask can instantly freshen up the entire face as I have noticed that skin looks brighter as it takes off the dead skin and makes the pores shrink slightly. Skin feels tighter than before. The results are very slightly obvious but it indeed makes a difference if I compare the before and after. The tube contains 50 g and costs only 75 bucks, the peel off mask tube will last for around 7-9 uses that way. On an average 10 bucks for a single time is amazing. What else one can ask for at that price. Take: Everyuth Naturals Golden Glow Peel Off Mask is good for that instant skin rejuvenation which makes skin look slightly brighter and better than before. At such a price, the product is undoubtedly good. I will recommend it! Go ahead, try it. Looks yummy.. last I used was from oriflame after that totally forgot about peel of masks. Will check this out..